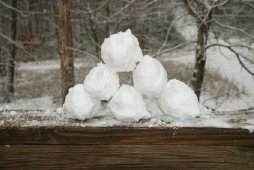 This Snow Ball Time Capsule will help you remember fun winter memories! A great craft to share with friends! 1. Find a piece of paper and pen. Write down a special message or memory of winter time. Place your message into a baggie, make sure it's the zipper kind so your paper won't get wet! 2. Place your baggie into a snow ball and then place your snow ball in the freezer. When summer comes take the snowball out, let it melt and read your special message. You could also put small freezable objects into the baggie as well!